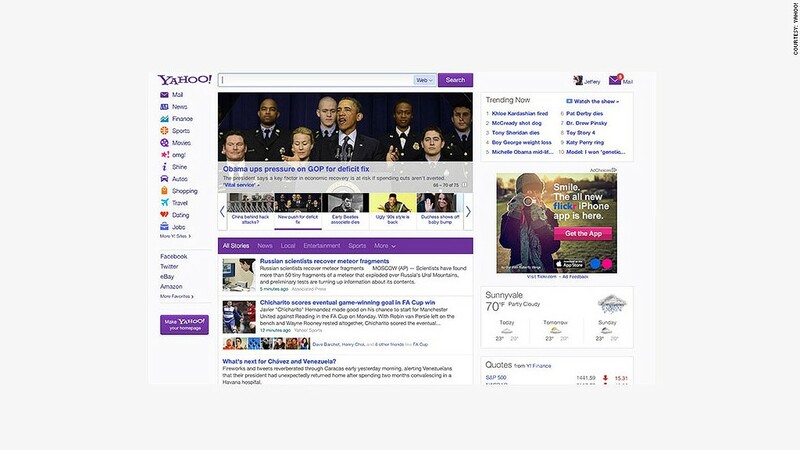 Yahoo's new homepage began rolling out to users on Wednesday. Yahoo unveiled its new homepage on Wednesday, in the company's most visual product overhaul since CEO Marissa Mayer joined the company in July. The new homepage, designed to be more "intuitive and personal," features a customizable news feed that allows users to browse the latest articles and headlines. Its main feature: an infinite scroll of personalized stories, tailored to users' preferences and filled with recommendations by friends on social networks. If you tend to click on more entertainment stories, you'll see more entertainment pages pop up in your feed. The homepage allows users to log in through Facebook or Yahoo (YHOO) to personalize content and share with their friends. Redesigning the homepage was a practical next step for Yahoo's new leadership, according to Semil Shah, an independent mobile and startup consultant. Despite the fact that users are increasingly navigating to Yahoo's massive stash of content via search engines and social recommendations, millions continue to visit Yahoo's homepage every day. "It's a huge Internet property that a lot of people are still going to," Shah said. With a richer view of users' interests and an better social experience, Yahoo's redesigned homepage may also better appeal to advertisers down the road. Brands are constantly looking for ways to make money through personalization and targeted advertising. But Mayer, who came to the job from an executive position at Google (GOOG), has stated previously that her "top priority" for Yahoo is mobile devices. That's why the new homepage was optimized for smartphones and tablets, the CEO said in a blog post. It's a move that could serve as vital to the company, looking to reinvent itself in an era where users are constantly accessing the web via smartphones. "My guess is this would be followed by the release of mobile products that are native, and that's been part of the acquisition strategy of the company," said Shah. The company's first acquisition during Mayer's tenure was mobile recommendation company Stamped, which Yahoo bought in October. Down the road, Shah said he wouldn't be surprised if the company rolled mobile apps for specific interests like sports and autos. The new homepage will be rolled out to users in the U.S. over the next couple days. It's the first major product revamp under new leadership since December, when Yahoo redesigned Yahoo Mail.